The 18-46th Avenue is the line I take to get from my home in the Outer Richmond district to my job at SF State. I also took this line as a graduate and undergrad at State, and frequently took this line when going to City College (via the 29-Sunset). It was known as one of the best bus lines in the city, and was extremely desirable for the most senior Muni operators for the easy to drive route, happy passengers, and great views. For the passengers, this bus line was always on-time, reliable, and able to connect with many major lines heading towards downtown. But after the major re-route on December 5, 2009, the line's reputation has gone down the gutter. I never see the same bus driver every single time, the on-time reliability has dropped drastically, and the morale of the passengers is really low. Problem 1: It's not a community service route. As you see on this weekday grid provided by Muni, the 18-46th Avenue is receiving the worst service reduction out of the rest of the lines. Service is being reduced from 20 minute frequencies to 30 minutes (mid-day weekday, weekday evenings, and all-day on Saturdays and Sundays). Why is it the worst? Look at the mid-day weekday time changes: the 18 is going to be cut back 10 minutes while many other lines are only getting a cutback of an average of 3 minutes (5 minutes for the 33 and 37). Also, no other lines (other than the 18) are being reduced to 30 minute frequencies. As you look at the grid, you will notice the lines currently operating mid-day with 30 minute frequencies are the lines considered "community service" and typically runs the 30-foot hybrid buses and specifically drive within a certain neighborhood or smaller zone versus buses that drive miles covering multiple neighborhoods/areas. By doing a reduction in the 18's service to 30-minute frequencies, it's like turning the line into a "community service" line instead of it's true nature, a crosstown route like its brother, the 29-Sunset. How can Muni punish the 18? 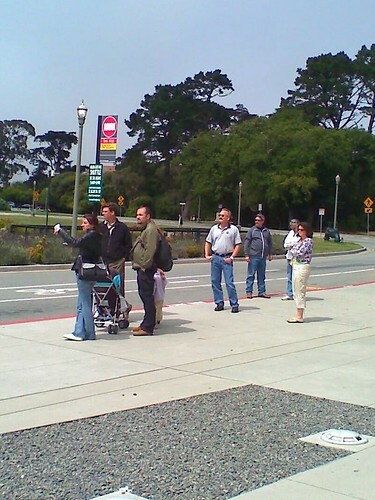 This line is the only lifeline serving the far west end of the city, and is the sole bus route route to access the Janet Pomeroy Center, Legion of Honor, and the apartments along John Muir Drive (southern end of Lake Merced). Stonestown, SF State, Lowell High, Janet Pomeroy center [for the disabled], SF Zoo, Ocean Beach, Beach Chalet, Safeway "at the Beach," Balboa business district, and Legion of Honor. 1, 1AX, 5, 16X, 17, 23, 28, 28L, 29, 31, 31AX, 38, 38L, 38AX, 71, 71L, L, M, and N.
Problem 2: Post December 5, 2009 reroute not helpful. The 18 used to run along Geary and Point Lobos, and passed by the Cliff House. But after December 5th, Muni decided to run the 18 along Balboa and Cabrillo and remove the 38-Geary Ocean Beach. I've argued that it is a bad decision to eliminate the 38-Geary Ocean Beach branch and Muni should have eliminated the Fort Miley branch since the 38L (weekdays and Saturdays) and 38 (weekday evenings and Sundays) drops passengers just ONE BLOCK away from the hospital. If Muni just eliminated the Fort Miley route, there would be no reroutes for the 18 or the elimination of the 38-Geary Ocean Beach branch. The 18 currently runs at 20 minute frequencies which is less than what the 38-Geary Ocean Beach branch ever operated, and when changing the 18's frequency to 30 minutes, the passengers will suffer greatly. Many have to ride the 18 so they can connect with the 5-Fulton, 38L-Geary Limited (faster ride to downtown vs. the 31-Balboa), and access to Chinatown via the 1-California. Can someone tell me why Muni is targeting the 18-46th Avenue? I thought the re-routes were bad enough, but 30-minute frequencies just makes it worse. When a Muni representative presented to the SFMTA Board the service cuts, the lady specifically targeted the 18-46th Avenue. I thought to myself, why target the 18? Why get on the microphone and do a P.R. stunt for shock value by saying the line will be getting cut to 30-minute frequencies (10 minute increase) while not comparing all the other routes that will only get a 3 to 5 minute increase to no more than 20 minute frequencies? The 18-46th Avenue will receive a 33% cut in service. How can they claim a "10%" reduction? Just today, I was reading NextBus and it showed the 18-46th Avenue was to arrive in 14 minutes and 44 minutes. There's supposed to be another one in 29 minutes (15 minute frequencies during rush hour). Reliable? Not anymore. If this agency has a grudge against me, don't take it against the public who ride this line. Do you like someone who can find huge mistake, expose it on the internet, get it re-tweeted to thousands of people in a matter of minutes, and change public policy? I've done it multiple times: Not posting new route schedules and failing to update trip planning programs just a week before changes, barely informing the public about a pass hike, ineffective fare inspectors, and Muni promised to accept "Muni to BART" transfers for the ride back from AT&T Park and I exposed them on video of them failing on their promise. You will not let the 18-46th Avenue die. I won't let you do that without a fight. The 18's original routing, like you say, was the best. They really enjoy frakking around with this line, and it's more important than people realize. Plus the drivers on this line tend to be super nice. I had a hilarious conversation with one on a sunny summer Saturday afternoon about Muni, etc. Classic moment in SF.